If you are looking for cheap and comfortable place to stay in historical house, then our hostel is the best mach! We offer our guests best prices, friendly staff and lots of emotions! We are located in in historical house, built in 19th century, where Estonian writer August Gailit lived and worked on his famous novels “Fresh Sea” and “Toomas Nipernaadi”. 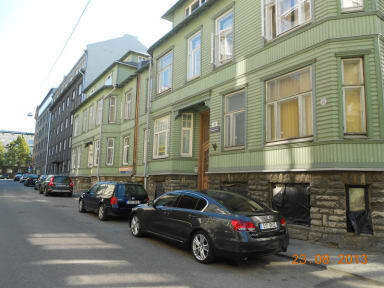 Kaupmehe Guest House offers you a great location! 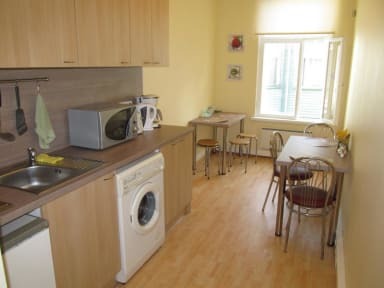 In our hostel you will appear to be in the exactly in the center of Tallinn. Biggest shopping centers, best clubs, bars, theaters and restaurants are only 5-15 minutes away by foot. Public transport only 5 minutes away. We are located only 1 km away from Tallinn coach station! We have comfortable and inexpensive rooms for 21 persons. Separated shower and WC can be found in the corridor. Some rooms have personal TV and refrigerator. We can offer 3 x Twin Rooms, Triple Room, 2 x Quadruple Room and a 8 bed dormitory room to our clients. Private rooms are equipped with TV. We have 3 kitchens and wc/shower rooms in our property. Kaupmehe Guest House Policies and Conditions.